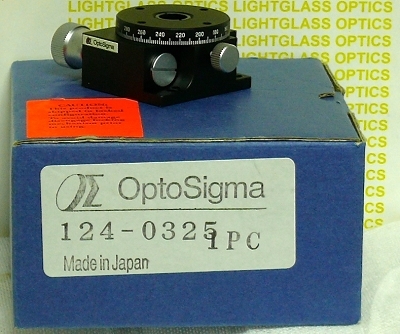 The OptoSigma 124-0325 40mm Continuous Rotation Stage offers full 360 degree rotation, with a fine pitch worm drive. It has a locking thumbscrew to hold the stage position in place, once you have it dialed in. The top plate has 4 M3 holes for mounting your items on. This has an 8mm though hole, so it can be used for prisms, polarizers, etc.